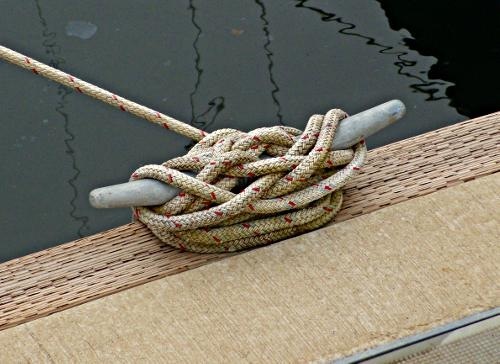 Walking down any dock and you will soon decide that tying a cleat is a dying skill. Many docks have up to 40% and sometimes more of the cleats tied strangely, this includes the docks of yacht clubs that bear the names of major cities in the Northwest. Boating is part style and poorly tied cleats cause you to loose style points as how your cleats are tied is one of the first things people notice when walking by your slip. Badly tied cleats can also be a safety issue in some circumstances. So lets style a safe cleat! Start by going around the base of the cleat on the end of the cleat that is farthest away from the load. Wrap the turn around the base then come up over the top of the cleat. Go over the top of the cleat and under the first horn that you started around and over the top of the cleat. Now put a Half Hitch around the second horn. 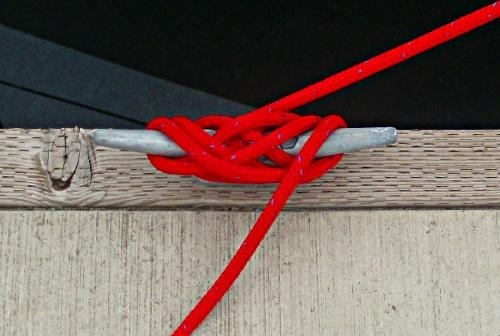 Put an underhanded half turn in the line to form the Half Hitch and put the loop that is formed around the second horn. The Hitch is also called the Weather Hitch. Don’t worry if the turn is the wrong way and the line starts to lay along side the cleat and not over the top, just reverse the turn twice to form the Half Hitch. 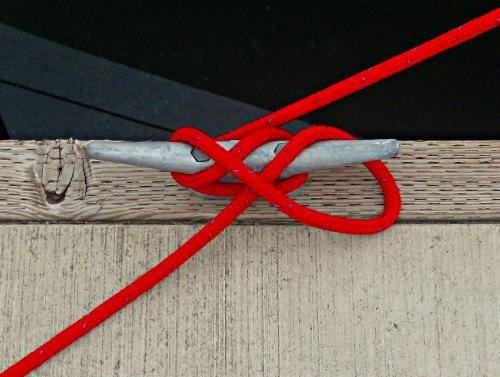 You are tying a Clove Hitch on the cleat. Only ONE Weather Hitch on the cleat. The Weather hitch should be the last Hitch on the cleat. 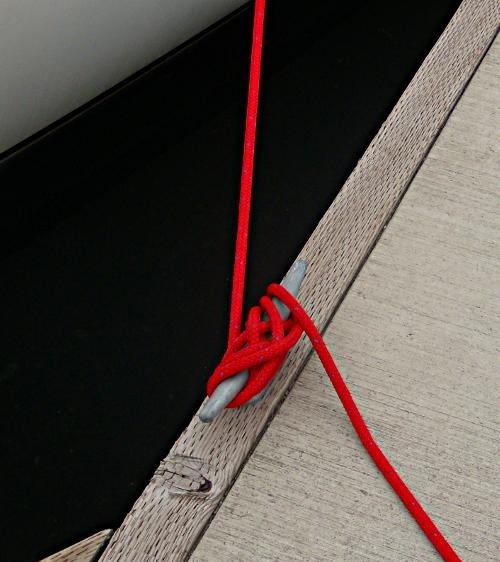 If more than one Weather Hitch is used, untying the cleat can be very difficult and it can take extra time to untie the cleat. More than one Weather Hitch can also cause the line to jam on the cleat under heavy load. A jammed cleat can be a serious safety issue and result in injury or death to people in the area or damage to the vessel. Now pull the slack out of the line and that is all there is! 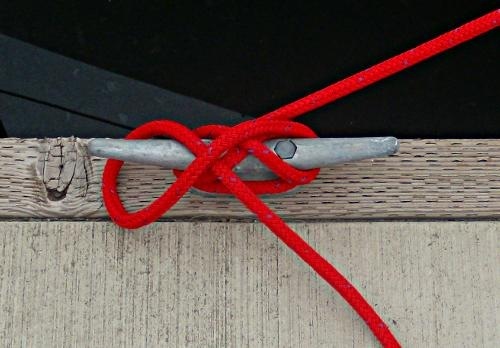 The line should form a nice smooth knot on the top of the cleat. If the cleat is highly polished or the load is high an additional “8” turn or may be required. Take an extra “8” before putting on the Weather Hitch, don’t make an extra turn around the base as that can cause the line to jam. Usually one extra “8” is sufficient. Mismatched cleat and line size may also require and extra “8” or two if the line is small compared to the cleat. A finished cleat with an extra hitch on it is shown below. Remember, no matter how many turns, “8’s”, or hitches are made, use ONLY ONE WEATHER HITCH! In a hurry or need to be ready for a quick getaway from the dock? Then just put some extra “8’s” or hitches on the cleat and omit the Weather Hitch. 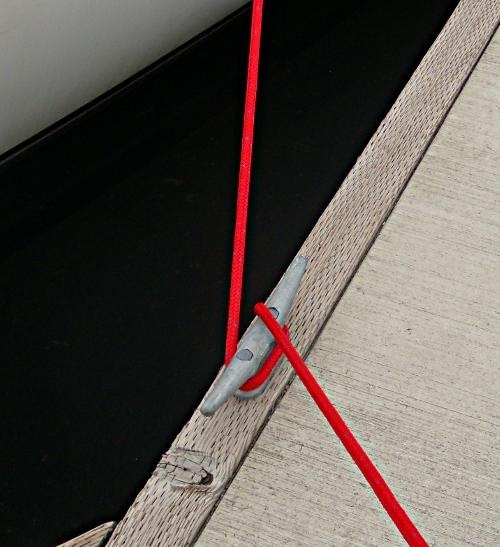 If you are towing another vessel, tied in the locks or need the cleat to be untied quickly the weather hitch should be omitted and extra “8’s” added, it is always a good idea to have a line tender in these cases should a problem occur that requires a quick untie. Some people omit the weather hitch and use the extra “8’s” method even at their home slip. What to do with the bitter end? I just zigzag it back and forth alongside the cleat. Some people like the neat look of a Flemish coil, the neat bull’s-eye coil that is flat on the deck, if a Flemished coil is left too long it will pick up extra dirt and in the Northwest leave a round, slick, green mess of mold on the deck and the underside of the line. I prefer the zigzag method that, while it does not look quite as “nautical” or neat, but the zigzag leaves less of a slick spot on the deck. No matter how a line is stored on a boat in the Northwest, if the line is in the weather it will tend to get moldy during the winter so just get used to cleaning your lines in the spring to make them better to handle. Well Sailor – Tie My Cleat – Which one will it be? 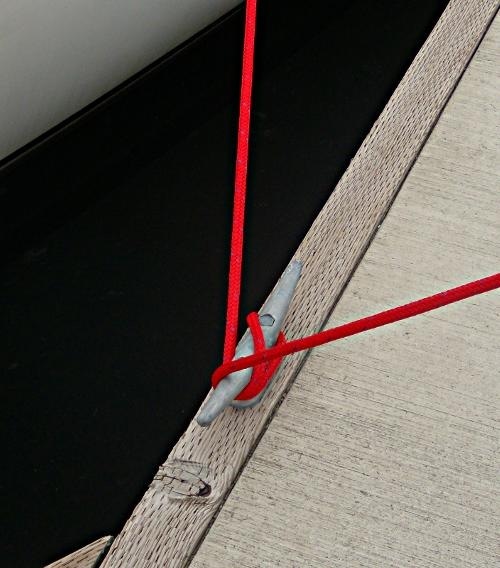 Please see How to Tie Your Boat to a Bull Rail – Part 1 for information and instructions on tying your boat to a dock that has a Bull Rail when there is not a cleat to tie to. 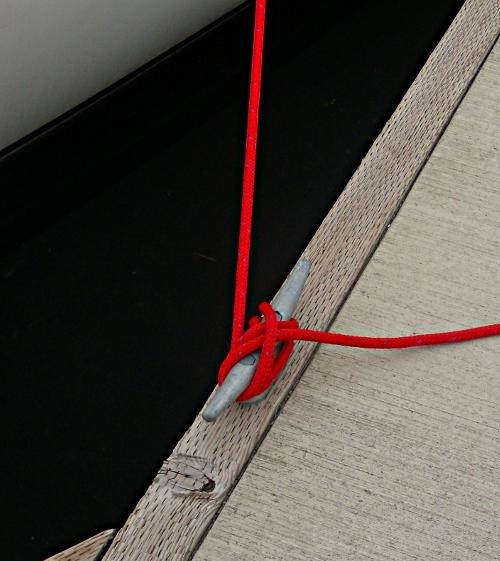 Please see How to Tie Your Boat to a Bull Rail – Part 2 for more ways to tie your boat to a Bull Rail when there is not a cleat to tie to. 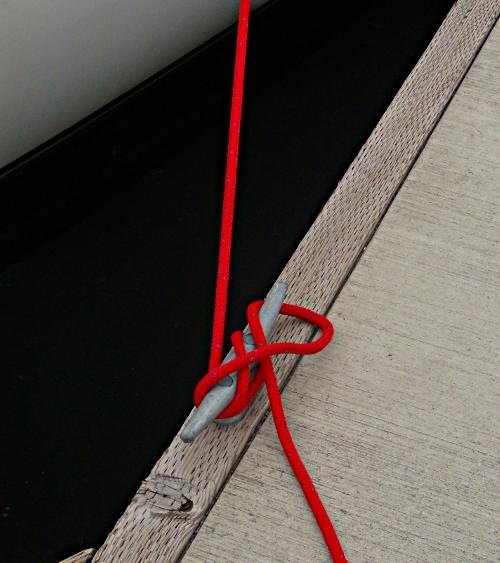 This entry was posted in Sailing and Boating Skills and tagged boating knots, boating safety, boating skills, How to Tie a Cleat, knots. Bookmark the permalink. 8 Responses to Is This Your Cleat? 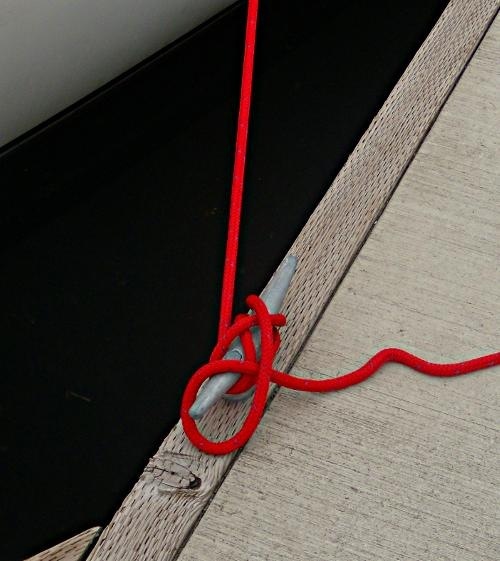 Far better to simply put the eye of the mooring line on the cleat, leaving a clean dock. You’ll never see the big boys with a bazillion miles of mooring line on the dock. By the same token, when you pass a line to the dock for someone else to take, give them the eye, ask them to put the eye on the cleat and stand back. It ‘s a u-boat, not their boat. A line handler on the dock with a bitter end suddenly becomes the captain. More lines, more captains. Bull rails are a bit more problematical, captains everywhere until you can abandon ship and take over. Same goes for rafting. Give the receiving boat the evil eye. Remember, if they get hurt or pulled into the water, it’s your fault, no mater how incompetent they are. I’m not sure I agree. First of all, I wouldn’t hand the line off to someone that didn’t know what to do with it. Secondly, if I do hand a line to someone on the dock I want them to put it around the cleat and help control the load. As for rafting, I learned to double the bitter end back to the boat so that you can leave without a line handler on the other end. Either would work I suppose. Great discussion. Badly tied cleats are a pet peeve. Good to know that I’ve been doing it the right way. Thanks dad! 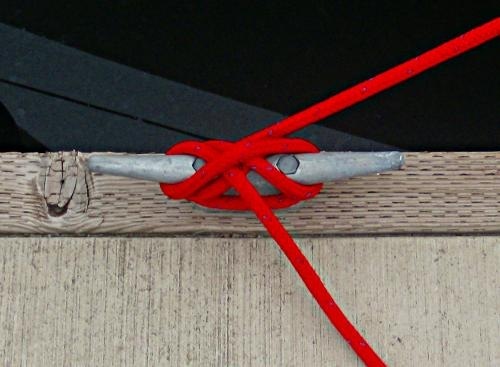 I usually take the bitter end to the dock and leave the eye splice aboard the boat. However, I’ve heard those who moor in windy or storm area caution against this. 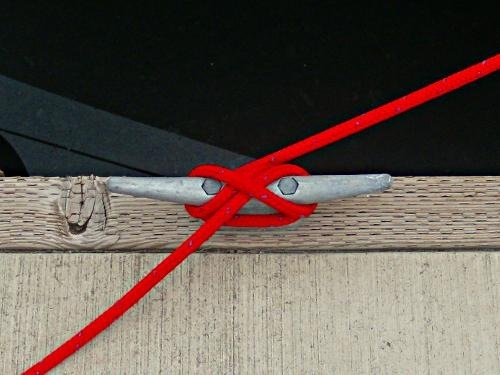 For them, the reason to use the eye loop on the dock is so they can adjust their mooring lines without leaving the boat. This could be an advantage if you tie up to a fixed pier in an area affected by tides. to the one of several fig.8s, there is not much difference. the other leaves a tail to be reckoned with. the line while keeping it off of the dock. of tension to the end than adding extra fig.8s, which don’t have so much frictional bearing. who-knows-what *mischief* on a mere half-hitch worries me –I’d want something more.